and has undergone the "Built for NVIDIA Tegra"
the hassle of changing batteries. What Games can the Viaplay Smart Gamepad F2 Support? Thousands of Android, iCade, and Emulator games are available to play immediately! Scan the QR code on the left for a list of compatible games. Please visit the Viaplay website to see a full list of supported games. Scan the QR code for Viaplay GameCenter-F app. dozens of touch-only Android Games. This item is covered by Viaplay Corporation Return Policy. Pros: It’s small, comfortable to hold and makes your phone feel like a portable game device. Really simple to set up. Directions are easy to follow. Cons: Not really useful for iOS devices. 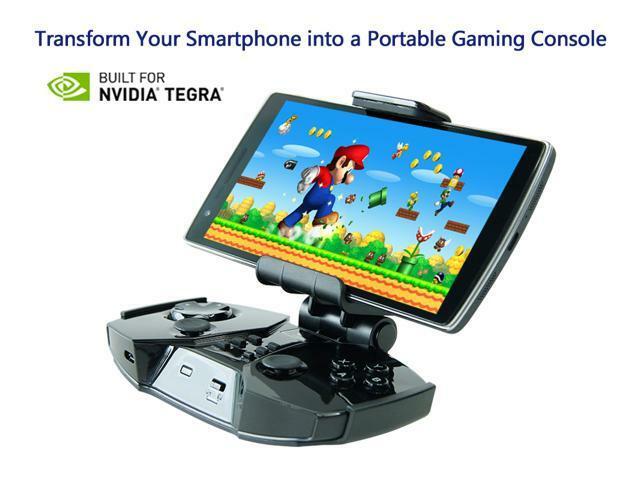 It does pair with my iPhone X, but from what I have read, it only will work with iCade games. This isn’t really clear on the app (nothing against newegg). I read the reviews and they are all for Android. I appear to be the first for an apple device. Short story is, if you think this device will allow you to play any of your iPhone games with it, you are mistaken. It was only $20 so I’m not too upset. Pros: Great product, easy to setup. Other Thoughts: They send me a replacement battery. Pros: - Worked well when I used a replacement Battery. Cons: - the fact i got a battery that couldnt hold a charge from the seller but at least I got a replacement one super cheap. - D Pad isnt great but it works well enough after you get used to it. Other Thoughts: For the price, yes it is a decent one if you don't like using screen controls for emulators on your android phone. Cons: Phone cradle is awkward. Many emulators have key mapping issues. The D-pad's actuation force is too high. Other Thoughts: I use this product on an LG Nexus 5. The D-pad is awful, you'll get a cramp in minutes with that thing. You could try opening the unit up and cutting out some of the rubber spring padding to make it softer. 1: The inner two L and R shoulder buttons are detected as axes (like joysticks). For example, this renders the MyBoy (GBA) emulator unable to use them, which is not comfortable at all when playing real-time action oriented games. This might not be an issue for smaller handed people. 2: The SuperN64 emulator is even weirder. The D-pad cannot be mapped to anything. The shoulder buttons work just fine though. You can map the C-buttons to the right analog, which is nice. High recommended. Shut up and take my money! Pros: Great response, feels good in the hand, appears to have quite a long battery life. Paired with my Droid Razr M with ease. Recharges quite fast as well. Cons: Requires root access to use the virtual touch feature, which was one of the main reasons I bought it. No indication in any of the specs or sales text about needing to root the phone. So, one of my main reasons for buying this controller is unusable for me. The cradle / phone clamping mechanism takes a little getting used to. It's very "front heavy" when using, so you get a little fatigue during longer game sessions. Other Thoughts: Would undoubtedly have gotten 5 stars from me, if not for the root access issue. There are many reasons that people can't root their phones, so if you are selling a product that REQUIRES it to use a major feature, please specify that right up front. Pros: Oh yes, very light, easy to carry even in my shirt pocket. I like the cellphone holder because it also seems to double as a protective case. I use the gaming mode mostly, however I do like to use its mouse mode when I connect my tablet to the TV, it helps me launch media streaming apps and whatnot. Other Thoughts: I recommend this product. It's fun to use and it really turns your cellphone into a tiny gaming arcade. Pros: I just bought this device. I've owned a few mobile gamepad's in the past.. Actually I really prefer the Viaplay F2 and I'm giving it 5 stars, here's why: - The joysticks are very comfortable to use, on other portable gamepads the bumps really hurt my fingers - This unit comes with a cellphone holder which I think has a really good weight balance. I use a Galaxy S4-I've mainly been using this bad boy to play through all the GTA titles on my phone. I'm up to San Andreas now :) High recommended. Shut up and take my money! Cons: it takes me a while to find the bluetooth pairing button. have to watch the video tutorial to know where it is located.